On behalf of Playhouse on Park in West Hartford, I would like to invite you to be part of our Literature Alive school field trip program for the 2018-19 Season. Literature Alive is an opportunity to extend the classroom by bringing students to the theater during the day for a matinee performance. See below for our offerings this season, we have shows appropriate for young children in Kindergarten all the way through high school. If there is a particular date you don’t see here listed within the run of a show, please email me and we can see about making arrangements. I look forward to welcoming you and your students! Teachers and paraprofessionals chaperoning the trip attend for free! 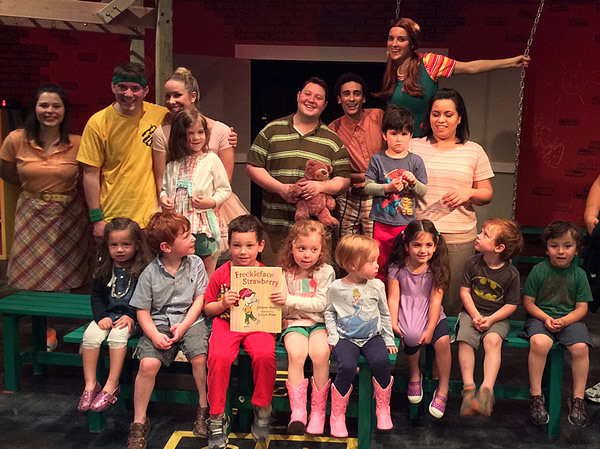 Solomon Schechter preschoolers attended Freckleface Strawberry! SENSORY FRIENDLY PERFORMANCES Sensory Friendly productions at Playhouse on Park are produced with guidance from The Miracle League of CT and professionals from the local autism community. Made possible by the generous support of The Miracle League of CT.
Based on the best-selling book series, Stanley folds his way around the world with his flat-tastic hijinks. Stanley Lambchop is your ordinary, everyday, run-of-the-mill, ten-year-old: normal mom and dad, normal little brother, normal life. That's just the problem... for Stanley, life is too normal. He wants to travel the world, do something amazing, something no one's ever seen before. Careful what you wish for, Stanley! One night, the bulletin board on the wall above Stanley's bed comes loose and falls – right on top of Stanley! The next morning, Stanley Lambchop wakes up flat. Not just a little flat... really, REALLY flat! In a whirlwind musical travelogue, Stanley – the ultimate exchange student – scours the globe for a solution to his unusual problem. He's stamped, posted and cancelled from Hollywood and France to Honolulu and beyond. And, whether he's thwarting a robbery at the Louvre Museum in Paris, or "hanging ten" off the coast of Hawaii, Stanley is closing in on his goal of being a three-dimensional boy once more. SENSORY FRIENDLY PERFORMANCES Sensory Friendly productions at Playhouse on Park are produced with guidance from The Miracle League of CT and professionals from the local autism community. If you need wheelchair accessible seats, please contact Elizabeth Simmons. Made possible by the generous support of The Miracle League of CT.
A boisterous, ribald and ultimately shattering, ONE FLEW OVER THE CUCKOO’S NEST is the unforgettable story of a mental hospital and its inhabitants. When a brash new inmate arrives, the rigid program of the ward, which is headed by the tyrannical Nurse Ratched, is thrown up for grabs. In a world where sanity means conformity and following the rules is the only way to survive, ONE FLEW OVER THE CUCKOO’S NEST is a powerful exploration of both the beauty and the danger of being an original. This Tony-award winning adaption by Dale Wasserman pays homage to the original storytelling of the Classic novel by Ken Kesey, while adding a chilling, poignant edge that captivates and enthralls audiences. Playhouse on Park has some funding available to allow students in need of financial assistance to attend productions. Please contact Elizabeth Simmons by email or phone at (860) 523-5900 ext. 15 to discuss whether your school group can take advantage of some of this funding.